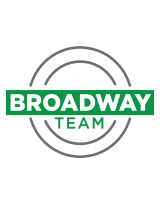 Collectively the Broadway Team has participated in over 125 million dollars of real estate transactions over a combined 30 years. My career began as a bridge designer after earning my Civil Engineering degree from Mizzou. I’ve worked in residential real estate since 2005. I grew up in Columbia and know the market well. I value my clients and take my fiduciary responsibility seriously. My engineering background helps me note important details, but my ability to communicate and relate to my clients best enables me to represent them well. I’ve bought and sold many homes myself and know how stressful the process can be. I work with the best brokers in the business at Re/max Boone Realty. My job is to help my clients achieve their goals and I personalize my service to what each needs. My wife and I are both Columbia natives and spend much of our time with our four children — often ensuring they make it to their many activities from dance to swimming to scouting. I’m an avid Mizzou Tiger fan and enjoy golfing whenever I can. I also work with the marching bands at two of the local high schools. I design portions of their field shows and teach during the Fall. It’s a great activity for young people!